On our recent vacation to Southern California, we asked the kids what they wanted to see. “The Zoo!” they emphatically responded. It never fails, we always enjoy the world famous San Diego Zoo. They have the most animals, the best new exhibits and are always improving old ones. 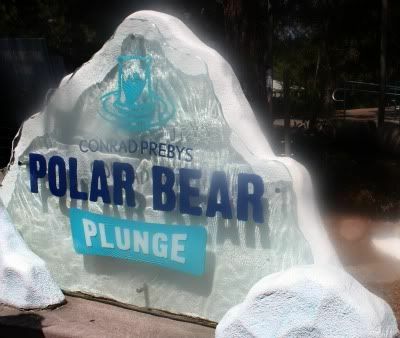 And the Polar Bear Plunge is no exception. 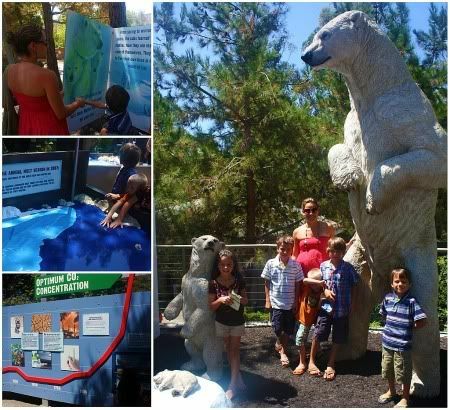 Until it underwent the revamp, the polar bear exhibit was relatively simple with a viewing area of the animals both in and out of the water. But now, much like the Elephant Odyssey, it’s more of an experience. The viewing area has been expanded and at certain times, visitors can even watch the bears being fed. My favorite new addition is the life-size bear statues that you can stand next to and thank God that you didn’t meet a real bear in the wild. The adult polar bear is HUGE!! Out front, there’s a giant storybook that tells about the polar bears and their way of life. Our kids enjoyed turning the pages and demanded that mom read to them every word. The little one’s will like both the ice cave that they can crawl in, as well as the real-life helicopter that helps tell the story about how scientists track these grand beasts. And without taking a position on Global Warming, the final addition to the exhibit details how the bears’ habitat has changed in recent years and the challenges that they face.